Over a decade after the Concorde made its last flight, aerospace firms are working on the next generation of supersonic aircrafts. Leading the fleet is Lockheed Martin and its N+2 jet (pictured), a commercial supersonic jet that can fly up to 80 people from New York to Los Angeles in just two and a half hours. Currently in development, it would cut the current travel time in half. The N+2 achieves supersonic speeds of Mach 1.6 with a new tri-jet engine system, featuring one engine on top of the plane and the remaining two under each wing. At the moment the main pitfall regarding supersonic jets is the noise of the Sonic Boom. Engineers at Lockheed and Boeing are working with NASA to lower the roaring sound which follows the plane the entire time and makes supersonic flight generally illegal. The engineers are positive though and believe it should be achieved by 2022. Lockheed isn't the only firm traveling at supersonic speeds. 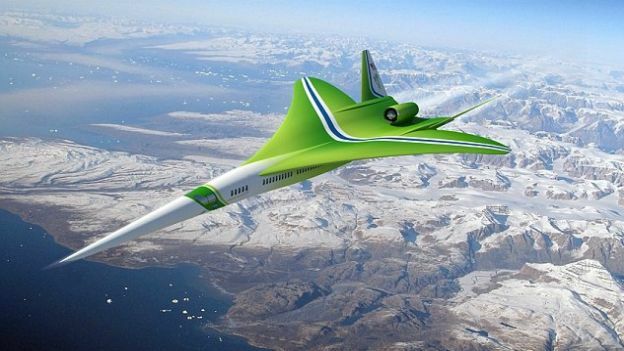 Nevada-based company Aerion is working on a 12-passenger, business jet that can hit Mach 1.6 and travel at 1,217 mph. Spike Aerospace is working on a similar supersonic jet for the rich and famous that would also carry passengers at a speed of Mach 1.6. The company boasts on its website that flying on the plane "will make any other jet feel like flying on a prop plane." Unsurprisingly the supersonic trio won't be that accessible at first, offering luxury service on a handful of select routes for a hefty price. With time and research though, the futuristic fleet will reach the masses.